I recently tried some oatmeal, my first taste of it in years, and I was surprised at how much I liked it. Good thing, considering how oatmeal seems to be back in a big way. Starbucks. Oatmeal is its most popular non-drink item. And starting March 3, in an answer to being a gourmet coffee chain in tightly-budgeted times, it's introducing value meal type options for $3.95. You can order a tall late and oatmeal for $3.95 (or skip the oatmeal and get reduced-fat cinnamon swirl coffee cake). 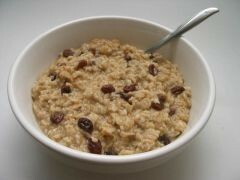 Oatmeal recipes are frequently popping up on budget blogs as an affordable meal. At his Super Bowl party, President Barack Obama offered his guests oatmeal and chocolate chip cookies. Maybe that last one is a stretch, but mark my words: oatmeal is making a comeback. And when you find yourself grilling oatmeal-burgers on the barbecue this spring, you can remember you read it here first.